With rapidly changing HIPAA laws and the new 5010 and ICD-10 updates, it's critical for healthcare training to be current. Part of the requirements for compliance includes conducting an analysis of existing systems, refining and improving documentation to integrate the changes and then training the staff on the new systems. The implementation can be daunting, particularly with an October 1,2013 deadline looming in the not-to-distant future. Especially critical is ensuring that key employees understand the idiosyncrasies of complying with regulatory changes, document requirements, policies and procedures, and compliance training of all associates. There are many administrative burdens placed upon physicians and medical care professionals with regard to assuring changes. With regard to training, we've identified the top !CD-10 trasformation training considerations. Change should be met with open communication and dialogue, especially when they involve federally mandated compliance changes. Having a training plan in place that is openly discussed and objectively agreed to by management and associates is advisable. Preparation is key to the smooth transition from ICD-9 to ICD-10. All employees should be prepared for the change with cascading communications that describe the business impact from an organization, department, and individual view. Each view should include the, “who, what why, when and how” information that fosters urgency and ownership. Planning should include the organization “acceptable” impact of service levels during and after the training events. ICD-10 Transformation Teams should have a Project Manager devoted to the Learning effort to ensure that all changes are communicated and included in the training package. Training goals and objectives should be written and measured against organization and department Key Performance Indicators. Courseware design and development platforms should be flexible enough to change with the evolving business needs…right up to the day it is delivered. Training delivery team may be augmented with contract trainers to avoid impacting “on going” efforts such as new employee orientation. Life-cycle maintenance on the training materials should be planned and based on specific business triggers. For example: IT updates, process changes, policy updates, and regulatory requirements. 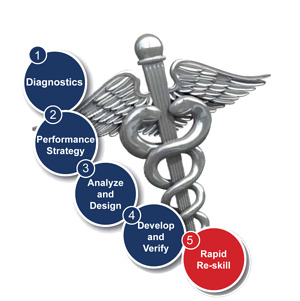 Course measures, at minimum, should include Kirkpatrick’s Level 1-3 and the results reported out to the ICD-10 Transformation Team, Executive Leadership, Management, Quality, and other key business decision makers. Utilizing best practices for instructional design makes the roll-out of these intiatives much easier and smoother. Because the risks of non-compliance continue to escalate in the form of fines, audits, suits and assessments, it's prudent to be proactive in becoming compliant with HIPAA 5010 and ICD10.